Learning by playing is a good method for children to increase their cognitive and social skills. Early environmental education is an important need to gain character development and environmental impact optimalization to the children, especially in golden ages. Golden age is the most valuable period in childhood time to gain any kind of information and knowledge from their environments. In this period, the children can increase their cognitive, psycomotoric, emotional, and social skills. Poor environmental education can lead to a future generation with lack of environmental awareness. Therefore, early environmental education is very important on shaping future generation, in order to reach sustainable environment. A board game is one of the good option as a tool to teach the children about a specific issue, for example environmental issues. ECOFUNOPOLY is a green board game which aims to provide an educational tool on sharing knowledge about environmental issues and also changing community behavior toward environment.This game was founded by Annisa Hasanah, a student from Bogor Agricultural University when she was in 2nd year of bachelor study (2009), and co-founded by Namira Andiani as the visual designer. In 2012, ECOFUNOPOLY has been officially received a certificate of National Copyright ( Hak Kekayaan Intelektual (HAKI). Ecofunopoly consists of one board 40 x 40 cm (for the small size) or 4 x 4 m (for the giant size), green and hot cards, action cards, pawns made from recycled papers, wood dice, global warming card, and carbon trees (made from recycled papers). The theme of Ecofunopoly is about carbon footprint. Carbon is used as a credit to calcute behavior of the player in the game. The aim of Ecofunopoly is to evaluate behaviour and awareness of the player towards environmental issues, for example energy, green consumption, water and sanitation, planting, etc. Ecofunopoly has been played by combinating practical activities to get more impacts (not only just playing). 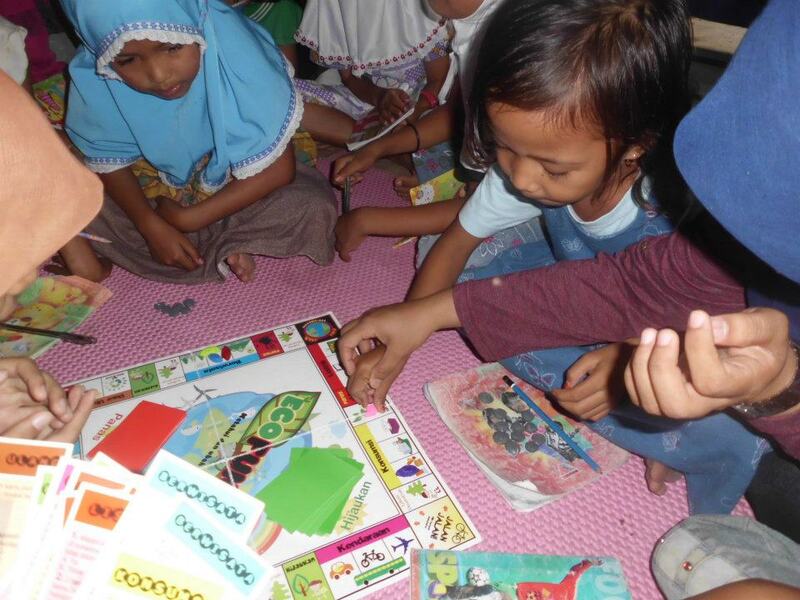 This board game has been widely spread in all over part of Indonesia as a teaching tool. ECOFUNOPOLY is a green board game which aims to provide an educational tool on sharing knowledge about environmental issues and also changing community behavior toward environment. For what ages Ecofunopoly can be played? For carbon footprint version, start from 9 years old above. But we are now working on the game version for 4-6 years old. This game is suitable for anyone, from children, teenagers, and adult. It is recommended game for a family to increase social interaction among family members and can be used as eco-reminder. In school, this game can be used as a learning tool for environmental educatoion subject. Who have been used Ecofunopoly? Ecofunopoly games can played in every situation or events, during free time or any special occasion. 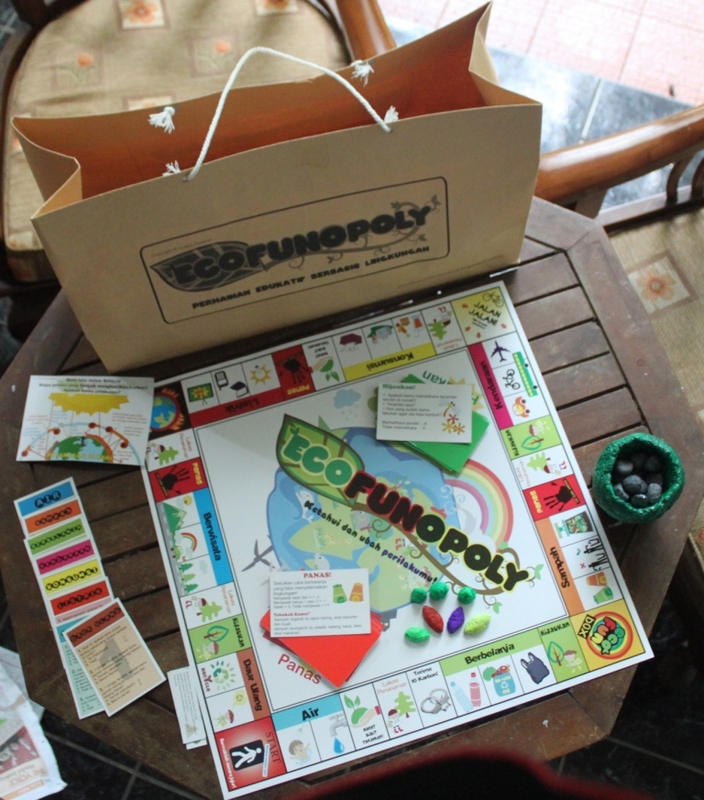 Ecofunopoly has been used widely by Indonesians, from every group: students, university students, social or environmental activities, NGO workers, parents, entrepreneur, event organizers, and game collector. This game has been used in many schools, social foundaton, and families from many cities and rural villages in Indonesia, such as Bogor, Medan, Lampung, Palembang, Makasar, Bali, Bulukumba, Yogyakarta, Pontianak, Jakarta, Tangerang, Denpasar, and many more. Furthermore, ECOFUNOPOLY was also used by some young teacher in INDONESIA MENGAJAR program, a program that initiated by Ministry of Education, Dr. Anies Baswedan. For the past few years, ECOFUNOPOLY has been used by university students for community service program in small villages around Indonesia. What kind of achievements that has been granted for Ecofunopoly? ECOFUNOPOLY has been received so many positive responses from many stakeholders, both national and international. 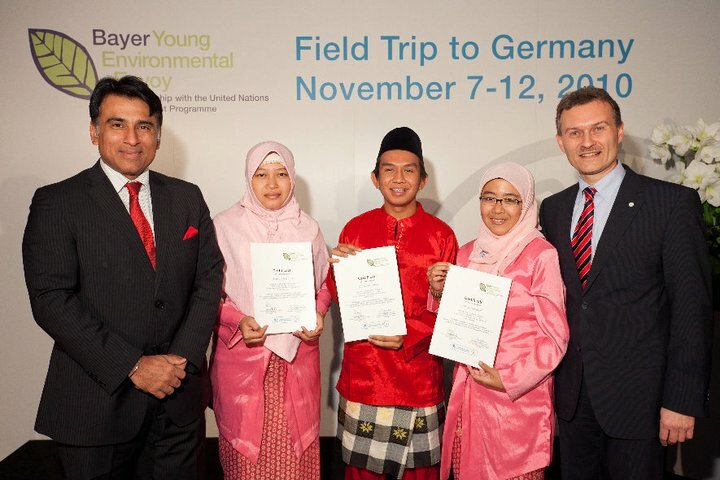 ECOFUNPOLY has been achieved several awards, such as : Danamon Young Leaders Awards 2009, ASHOKA Young Changemakers 2009, BAYER Young Environmental Envoy 2010 in Germany, The Best 3 Candidate Yahoo! 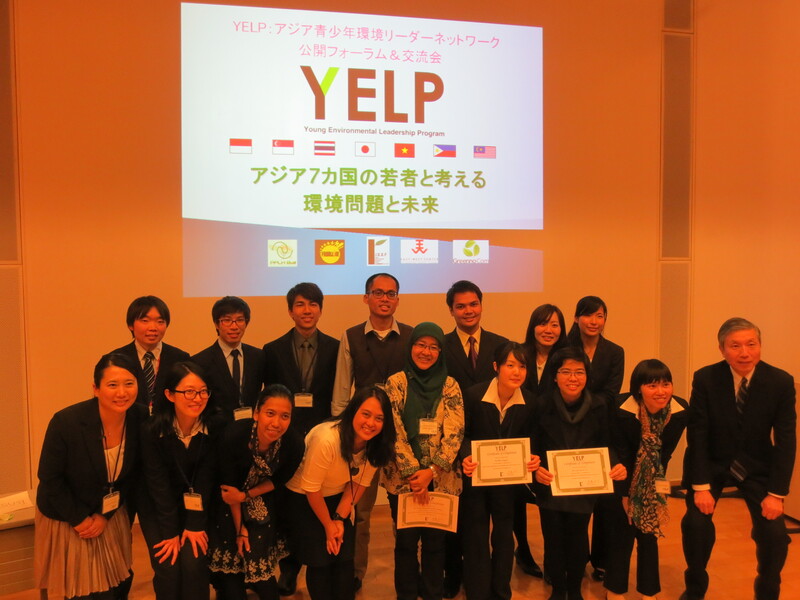 Indonesia17 for Green categoryi Hijau, Young Environmental Leaders Program (YELP) 2013 di Tokyo, Japan, Grantee of Bussiness Plan Scholarship from Bank Mandiri 2011, Grantee of Young Entrepreneur Program from Ministy of Cooperatives Small and Medium Enterprises, Republic of Indonesia, and Kreativitaet im Studium Award from University of Goettingen, Germany. ECOFUNOPOLY has been presented in many international forum, such as Future Leader Summit 2011 in Semarang Central Java, UNEP TUNZA International Conference 2011 in Bandung, Indonesia, Young Environmental Leaders Program (YELP) Open Forum in Oubirin University, Tokyo, Jepang, World Youth Congress di Istanbul, Turki, Make A Difference (MaD) Asia Forum Hong Kong, and many more. Like Our Facebook Page here.